Keyboardist Steve Weingart (Dave Weckl Band, El Grupo) recently released his second solo album, "Dark Blue Dream" (Skeewa Music). 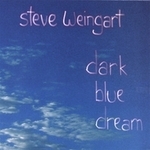 Joining Weingart on this album are Frank Gambale - guitar, Jimmy Earl - bass, and Tom Brechtlein - drums; with guest appearances by Ernie Watts - sax, Ronnie Gutierrez - percussion, and Renee Jones (Weingart's wife) - bass and vocals (there's no lyrics on the album, but Jones sings some supporting melodies on 2 tracks). I really liked Weingart's work with Steve Lukather's El Grupo band, and Frank Gambale is one of my favorites, so I was eager to check this disc out. The album features full band tunes, plus some compositions that Weingart put together completely on the computer. The group performances on the band tunes were all recorded live in the studio; a cool approach for a fusion record. Weingart later added some effects while mixing the tracks. The whole album has a west-coast feel to it, but it's very fresh. The combination of Weingart's writing, his use of ambient sound effects, and the live band recordings give the album a very "new" sound. The opening track, "Night Visitor", is one of the strongest tunes on the album. The main melody is great, and Gambale takes a nice solo over some cool changes. Plus, there's some intertwined guitar/keyboard lines in this song that almost give it a prog-rock feel in places. "3 Till Dawn" really shows Weingart's strengths as a composer and arranger as well. This tune is chock-full of great chords and melodies. "Dark Blue Dream" has a cool deep-funk groove. I love the way Gambale builds his solo on this piece. He starts with a measured approach, playing some sparse bluesy phrases with lots of space, before kicking it up a notch with some nice sweep patterns. Gambale also sounds great on "Pursuit"; a wicked funk tune where the band sounds tight and well-rehearsed. "Outside In (Part 1)" is a good example of how the live-in-the-studio approach really enhances the band tunes. Gambale and Weingart do some nice trading-off in the tune, and it definitely has a "live" feel. This is some of Gambale's best work on the album. For "Outside In (Part 2)", Weingart took some of Gambale's guitar lines from Part 1 and created an entirely new piece using drum loops and synth sounds. Pretty cool. Overall, this is a very fresh-sounding album. A lot of keyboard-heavy jazz fusion records sound stuffy to me, but that's not the case here at all. Weingart's writing and playing are great, and his use of effects and different synth sounds always keep things interesting. And if you're a Frank Gambale fan, you'll definitely want to pick this up. He plays some great stuff here, and knowing his solos were done live with the band make them all the more impressive.